My interest in creating a Corbin, Kansas Web site started with this old postcard above of Corbin in 1909, the year the school was built. Many of my own stories of Corbin are part of an autobiography, "My Sister Was an Only Child," which is available on the Web. Some of the content herein is based on that earlier writing. My interest was sparked again when my cousin, LaRue Watts, sent me the picture of Corbin School along with a brief history of Corbin he had written as an eighth grader. His short history herein begs to be read by anyone interested in Corbin. The postcard of Corbin belonged to my aunt, Finace Watts, and was given to her son, LaRue, who in turn gave it to me a few years ago. The back of the postcard has the name Mrs. Max Utterback [Orene], so I assume that it must have been hers at one time. 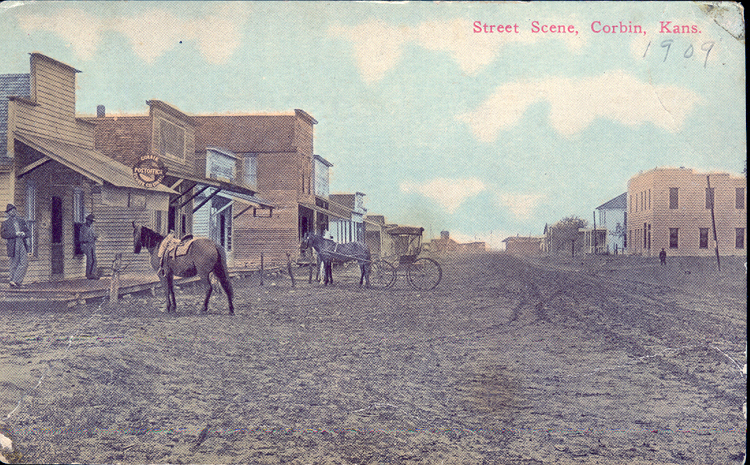 I really love this old postcard and felt it should be shared with anyone who has an interest or connection with Corbin. The scene is looking north up mainstreet. Although my family lived in 4 different houses in Corbin, the one we had the longest is just out of the picture on the right side of the photo across the street from the hotel. The Niebaum house actually started its life across the street north and just east of the hotel, but was moved to its final location sometime later. It was known in Corbin as the George Cox place for the family that owned it prior to us. The larger building on the left was the IOOF Hall, which housed the grocery store on the ground floor and lodge activities on the second floor. The lodges were the International Order of Odd Fellows [IOOF] for men and Rebekahs for women. Our mothers, Finace Watts and Grace Niebaum, who were sisters, were members of the Rebekah Lodge. I remember one carnival type party held in the IOOF Hall. It was a fund-raiser for the lodge and there were all kinds of booths to attract kids to spend money. I remember one booth had small fishing poles, with which you "fished" behind a curtain. When you felt a tug on the line you pulled out your prize. One side-show booth that tickled my dad so much was titled, "See the green man with the brown back." Inside were two friends talking - Perry Greenman and Bunny Brownback. Sometime after the above photo was taken a gazebo style bandstand was built about in the center of the picture. According to my parents every Saturday night a band would play in the summers. It was gone when I lived in Corbin. LaRue recalls that "the two buildings between the post office and the grocery store were torn down and a new smaller (white) post office was built in their place. The old post office, when we were kids, was home to the hardware store, run by Roger Whitten's dad, Frank Whitten. I always thought he looked like Randolph Scott. My folks bought him out and they ran the hardware store in that location until the Bank closed. Then the hardware moved into the bank building." I just finished reading the Wednesday, Feb. 2, 2011, Page 8 issue of ``The Caldwell Messenger'' with the nice story, ``Memories of Corbin'' written by Jerome Niebaum and assisted by LaRue Watts. Wow! I have some fond memories of Corbin when my parents, Amos J. and Phyllis Bozarth moved to Corbin in the year of 1948 from Pond Creek, OK. My father was hired by George Ridley of the Rock Island Line Railroad. My father worked with Mr. Ridley for five years while we lived in Corbin. My parents bought the two-story home just north of Francis Conrady's house, or behind the alley east of Raymond and Pauline Black's home. I believe they bought the house from the Hess family who lived east of Corbin. I have fond memories of Raymond and Pauline and also of the Conradys. Also, I have fond memories of the Niebaum home. If I remember right, it was the Niebaum home that had one of the first black and white television in Corbin, in the early 1950's. The night that my brother was born, my parent's car got stuck in the drive-way and Bob Rice drove my mother to the Caldwell Hospital where my brother, John was born. Dad had taken my sister, Alta and I (A.J.) to Finace Watts (LaRue Watts' mother) where we stayed the next couple of nights. I thought Finace was a really nice lady. I remember LaRue quite well. I remember LaRue at the Corbin Grade School when he had climbed a cottonwood tree just south of the school house, and slipped and fell from the tree and below he landed on a barbed wire fence which slashed his leg. He had a long slash on his leg which was caused from the fall into the fence below the tree. I remember how my teacher, Mrs. Ruby Martin was concerned for LaRue's welfare. I have fond memories of the Corbin Grade School and the two-room school house and the nice upstairs where the cafeteria, stage and auditorium were located. Mrs. Hess was the school cafeteria cook. Johnny Kern and I were classmates. Johnny and I were together from the first grade to the fourth grade. My parents moved to Wichita at the beginning of my fourth grade year. I was sad to leave Corbin and my school friends. When my father terminated his job with George Ridley and the Rock Island Line railroad, my father was hired by Boeing Aircraft where he worked for the next 25 years. Bob Rice and Jerie Murphy were fun for me to visit at the Corbin Oil Inc. office in Corbin. Bob loved to tease me. I delivered ``The Wichita Beacon'' in town during my third grade year. Mr. and Mrs. Lile were good friends of my parents, and Mr. Lile was the custodian at the school building, and he also would take the afternoon mail sack to the Rock Island Depot where he hung the mail bag on a pole, and the afternoon passenger train grabbed the mail bag from the pole with a hook as the train was traveling at a very high speed. I thought that was awesome. I enjoyed my summer Vacation Bible School at the Corbin Methodist Church. When we lived in Corbin from 1948 to 1954, I remember the Blacksmith shop ran by Mr. Neer, two elevators, Rock Island Depot, Raymond Black's filling station and feed store, Corbin Oil Inc. (Bob Rice and Jerie and Beatrice Murphy), one restaurant, grocery store, post office (Mrs. Rinehart was postmaster), Hardware store (where dad bought my first bicycle), the Corbin Bank (Mr. Porter Richards and Mr. Blue), Lumber Yard, Auto Garage (Francis Conrady, mechanic), the telephone office with manual switchboard, and the softball field where summer tournaments were held. Mom had sent me to the Corbin Bank the day that the bank examiners had come in and closed the bank for good. I was actually witnessing the history of a bank closing. The bank was closed because of embezzlement. The Stock Exchange Bank of Caldwell was the ``father'' bank. My dad took a picture of me in front of the Corbin grade school, a couple of years before it was torn down. Recently, I visited Corbin and I was sad to see so much of the town almost like a ghost town. I also visited the Corzine Cemetery, located south east of Corbin and look up the graves of those who I remember so well. I live at Conway Springs, KS. I bought ``The South Haven New Era'' when I was 23 years old and this is my 45th year of publishing the newspaper. I also own and publish ``The Norwich News'' which is my 24th year of publishing it. I own and operate a commercial printing business in Conway Springs. I started in the printing business when I was 16 years old. I have really enjoyed my printing and publishing career. Thanks Jerome Niebaum and Larue Watts for sharing the memories of Corbin, Kansas. Sincerely, Amos J. Bozarth, Jr. This Web has many contributors. Among them are Francis & Marvin Kloefkorn and Amy Lungren Shoffner. Thanks to them for photos and stories of Corbin. If you have stories of Corbin to share on the Web, please contact me.